Folks, Casa de Huespedes, Puerto Iguazu, Argentyna : Rezerwuj teraz! 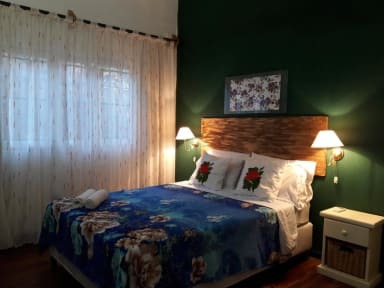 "Folks B & B" is a town house for those who want to experience the rhythm of life of the people of Puerto Iguazú and know the Iguazu Falls. The house built in 1950 in the center has 4 rooms: two rooms with private external bathroom and two rooms with bathroom en suite all with their own decoration. 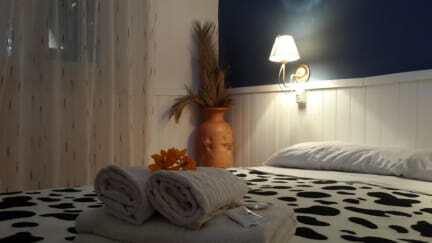 A guest house for those who travel the world and look for a home. A place where you enjoy simplicity as the ultimate expression of wealth. We offer you a good bed, a good breakfast, a good nap, a smile and the best tips to get to know the whole area of the Iguazu Falls. PLEASE: If you arrive outside check-in hours, send us an email with your approximate time of arrival so that someone can receive you. Late check out (after 11:00 AM and before 04:00 PM) may result in a fee. There are no cancellations or changes (early departure or less room nights) 3 days or less of your arrival date. **Within 3 days of your arrival the full balance will be due. There are no cancellations or changes. **Full payment must be made within 2 days after booking the room. -For special holidays or events, please review our Special Booking Cancellation Policy. "No show" is considered when the guest does not arrive on the expected arrival day. The room will be hold until 12AM the following morning at which time the reservation will be considered as cancelled if no contact has been made by the guest and the full balance will be due. Arrival Time: Please let us know your estimated arrival time to be ready to greet you at the Guesthouse and open the gate for you. Folks Iguazu allows guest arrivals between the hours of 14:00 and 22:00 Hs. Check-In / Check-Out Policy: Check-In time is 14:00-22:00. Check-Out time is 11:00. Early Check-In is available if your room is not occupied from the night prior. Late Check-out is available if your room is not occupied that night. Otherwise we will take care of your luggage while you seize the day until Check-in or Check-out time. Room Rates & Currency: Prices are quoted in American Dollar (USD). There is no capacity for extra beds in the rooms. Payment — We accept cash, credit card, debit card or bank transfer as payment for your stay. Payment is accepted in Argentine Peso, Brazilian Reais, US dollars (preferred) or Euros. Breakfast — Breakfast is served our dining room from 7:30 to 9:30 AM. Sheets and Towels — Please take care to remove sunscreen and make-up with soap and water before using white sheets and towels. - sunscreen and make-up can leave permanent stains on the linens. Minimum Stay — a minimum stay of 1 night is required unless this is special holiday or Easter holidays where a 3 night stay is required. Children Policy — Only children 12 years old and older. Smoking — Smoking is allowed only at our outdoor areas. Other Guests — No outside guests are allowed. Pets — Please beware we have cats on the premises. No guest pets are allowed. Keys — One set of keys is provided for each room. A charge of AR$400 for replacement of the locks if one or more of the keys are lost, no exceptions. Internet: WiFi is available in all areas of the hotel. It's courtesy.